A group of Boston College football players have come together to create the BC Chapter of Uplifting Athletes. The group is working to raise awareness and funds for rare diseases that affect fewer than 200,000 Americans. 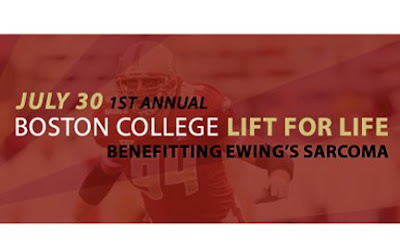 First order of business will be the First Annual Boston College Lift For Life Event benefitting Ewing’s Sarcoma, the rare form of bone cancer that has sidelined Senior Linebacker Mark Herzlich. Watch the 2009 Eagles take on each other and get a sneak preview for the upcoming season, while they help raise awareness for this rare form of bone cancer. I applaud your efforts guys. Keep it up. Show your support and make a donation in Mark Herzlich’s name. Let’s help the BC Chapter beat their fundraising goals!